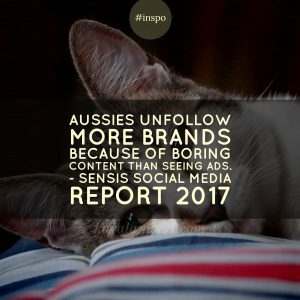 In this analysis of the Sensis report into how Australians use the Internet & Social Media, I will be focusing on social media and how customers use social media for purchasing decisions. While it’s important to know when we are online to work out when we need to post on social media, it’s the behaviours which drive purchasing decisions which interest businesses. This post is to be read with the previous article and can be compared with the previous year. When and where do Australians use Social Media? 92 % of Australians access social media at home. When we are at home, Australians are most likely to check their social media in the lounge room and then the bedroom. This is no great surprise when you look at when we are most likely to check social media. What you can see in this table is a good indication of when you should be posting on social media depending on your target age group. Unfortunately, may businesses are still posting outside of these hours because they do not schedule their posts. What can you do to influence the purchases made using Social Media? 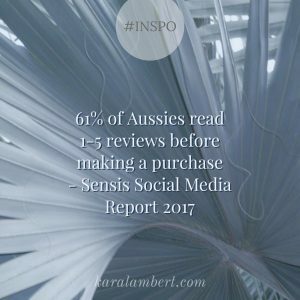 61 % of Australians will read between 1 and 5 reviews before making a purchase. Remember that this is across all social media and there are many ways to post reviews. While you can use the review function on social media profiles, I actively encourage business owners to regularly post reviews on their social media to push the good news out to followers. By doing this you control the design of the review and you can organise them how you choose. There has been an increase in people likely to change their opinion (to be positive) if you respond to a negative review. This means that you should keep negative reviews on your social media and respond to them. I have previously written about the psychology of reviews, it contains information on why people give reviews and the aspects needed to have a convincing review. This year, Australians said that it was more important (than previously reported) that businesses interact positively on social media, update their content regularly (post regularly), and post engaging and relevant information. Here’s the key to all of this, it’s what your customer thinks is engaging & relevant – not you. So it’s crucial that business owners understand their ideal customers. Here’s the thing about engaging and relevant content – not having engaging and relevant content is the biggest reason why people unfollow social media accounts. It’s not ads. In fact, Australians, while not necessarily happy to see them they are not turned off by them nor will they ignore them. So, consider ads as part of your social media, they’re not going to push clients away. – 29% want nothing at all. So before you think that your ad has to offer a great discount, consider that nearly 1/3 of your fans actually don’t want anything from you at all. I have one more thing for you to consider when using social media for your business and what Australians like when online. All Australians are excited when our posts receive more likes than usual. While this statistic is higher for those <39, there was some degree of agreeance across the ages. So, give some positive feedback to posts and comments on your social media account, even if it’s a like. If you want to know why this works, read my post on what happens to our brain when we use social media. So all in all, it seems that Australians are increasing their use of social media and while some want special offers a good proportion don’t want anything at all other than: good content, they like to be liked and if they research online they are more likely to buy online. It still points to the need for brands to have some sort of regular social media presence where the client is put first.